If you'd turned on the news or scanned through some financial headlines over the past few days you have seen that Ireland has now become the new problem in the European Union. 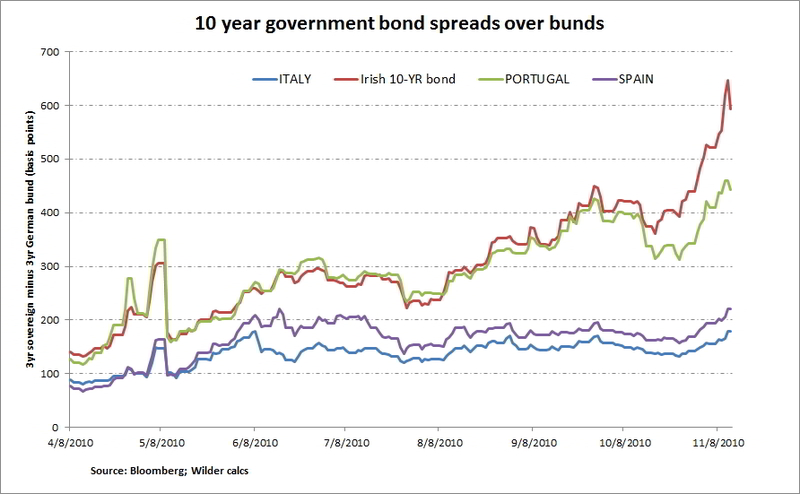 While all the PIGS (Portugal, Ireland, Greece, Spain) are moving toward insolvency/crisis, they have come in stages up till now. The breaking point is determined by the market when there is a run on the debt. This causes the interest rates on their bonds to rise significantly and causes the cost to insure the debt (CDS) to rise along with it. 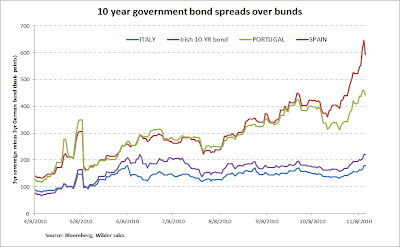 This happened to Greece last spring, and it has finally reached the next chapter in the form of Ireland when last week their bond market began to implode. The Irish story is far different than the Greek one told last spring. The Greek crisis was focused on their government debt, meaning they were closing in on the moment when they would be unable to make current payments, and their ability to borrow new money had dried up. It is the equivalent of living on credit cards and continuing to open up new cards every year to pay for last year's spending. It is also known as a ponzi scheme. If the Greeks defaulted on their debt, they would have had to work out a deal with the people who lent them the money. For example, they may only pay 10% of their "credit card" bill, and they would start over fresh. This is the way free market capitalism works, and it is the way it should have happened. The problem with this situation is that the other banks throughout the European Union in other countries that lent Greece money would take major losses on their balance sheet if they were to default. This would create what they call "contagion" as these losses would lead to bank failures and additional losses. So instead of allowing that to happen they created their form of the TARP program, which they called the ESFS. 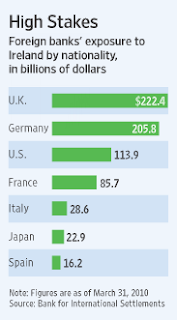 Greece received a $120 billion loan and a formal program for bailing out countries was now in place. Six months later: enter Ireland. Only this story has a slightly different twist. The Irish crisis is not in their government debt, they have enough cash to fund themselves to July 2011 and possibly longer, it is within their banking system. 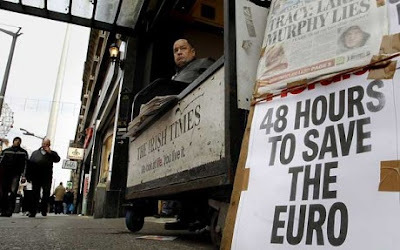 Back in September 2008 during the height of the financial crisis, Ireland decided to fully backstop their entire banking system moving forward. That move then has led to this crisis today as their banks are closing in on the "Lehman" moment. 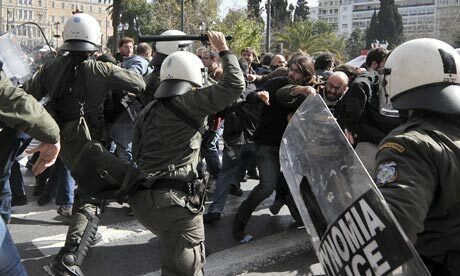 You probably remember the Greek riots last spring, but on the news today there are no riots in the streets of Ireland. This is because the problems are all with the banks. What is fascinating is that if Ireland takes the bailout, they will be forced to enter into a massive austerity (spending cut) program which will then bring the Greek lifestyle to the Irish people. Then you will see the rioting. The bail out is not for Ireland, it is for the $650 billion in bank exposure in other countries around the world. However, the Irish people would be the ones paying for this bail out. Stay tuned, this story is changing every hour. The implications of how this is handled will be massive for the currency markets, which now have a major impact on stocks, bonds, and commodity prices. I will comment much more on that topic as the final bailout decision and outcome become clear.